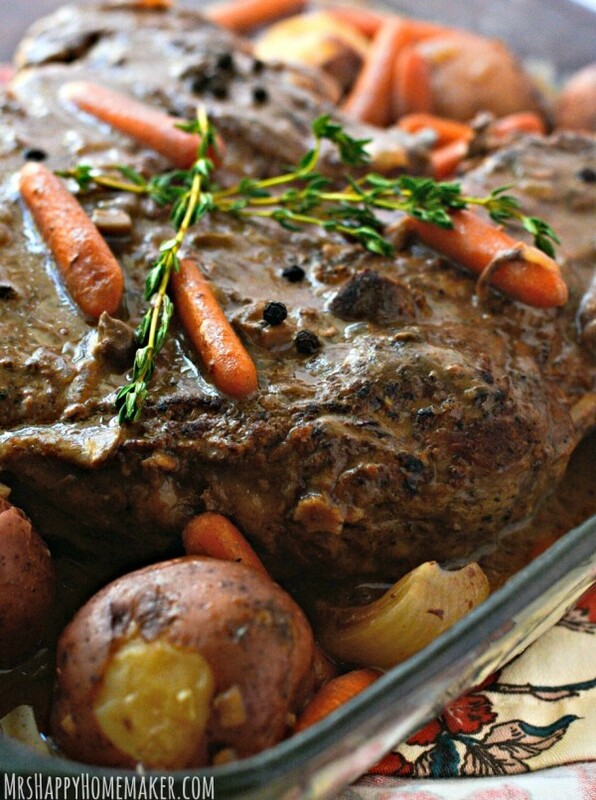 Are you looking for an absolutely delicious pot roast that requires almost no effort at all? Look no further because you’ve found it! 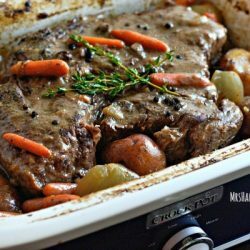 My Crockpot Pot Roast is the BEST EVER, only requires 5 ingredients, & is as simple as throwing the ingredients in your slow cooker and turning it on. Perfection! When I was a kid, pot roasts had to have been my least favorite meal. Well, except for the cardboard bran flakes my parents made me eat for breakfast (because fiber – thanks Mama). I seriously would sit there & pick at it and as soon as my parents were distracted, I’d call the dog or cat over. Or wrap it in a napkin, hide it in the trash, & cross my fingers and toes my parents didn’t realize what I’d done. The bran flakes, on the other hand, weren’t so easy to dispose of. The dog had zero interest in those (that should tell you something! haha)… so they required meticulous timing so that both my parents were otherwise distracted so that I could make it from the dining room table to the bathroom undetected so that the toilet could have my bran flakes for breakfast. Yes y’all – I totally used to flush my bran flakes down the toilet. Sorry, mom but they were gross! This pot roast has plenty of gravy & it’s all sorts of delicious… perfect for sopping up with some of my Mama’s buttermilk biscuits, or my 3 ingredient no-fail biscuits – or heck, even plain white bread. Sometimes I’ll mash up the potatoes on my plate with my fork and swirl it all together with that yummy gravy. All 3 of my kids shovel this in their mouths & always ask for seconds and thirds. Well, ,my 5 year old doesn’t ask for seconds of the carrots but hey – he’s 5. 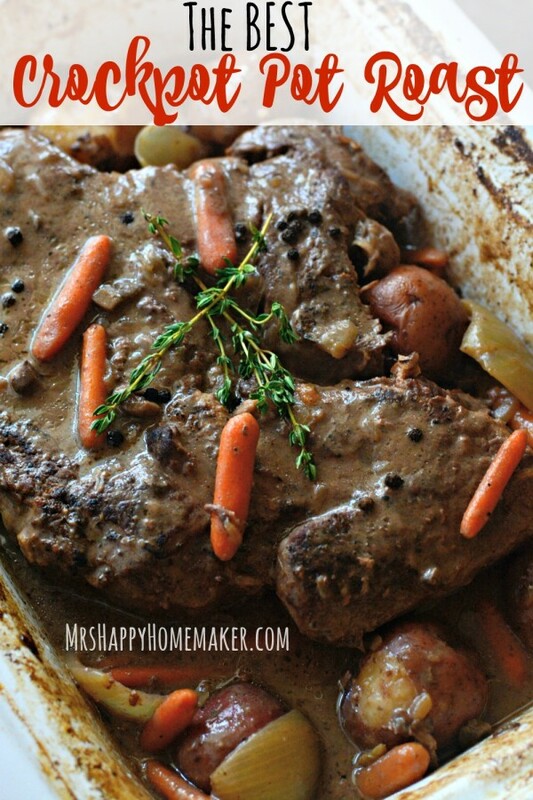 When my husband was still alive, he’d straight out refuse anyone else’s pot roast. Actually, he straight up hated pot roast (or so he thought) until he tried mine. It’s perfection you guys. 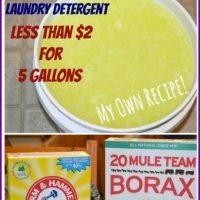 Have I mentioned how easy it is to make this? If I have already, oh well – you just heard it again. 😉 Only 5 ingredients (not counting pepper) – well, 6 if you decide to add onions. It cooks in the crockpot all day, so you don’t even have to mess with it. Plus, it makes your house smell amazing. 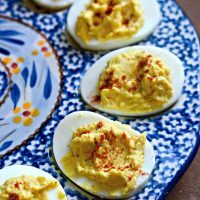 You may need to nail up a couple of ‘No Trespassing’ signs before putting this in your slow cooker for the day because those pot roast vapors are so indulgent that you may begin to lure your neighbors, mail man, school bus driver, & a couple of neighborhood dogs to your kitchen in some sort of hypnotic trance. Well, heck – I guess if they’re in a hypnotic trance… those no trespassing signs won’t do much good, huh? Season a 4 to 5 pound (sometimes I even use a 3.5 pound) chuck roast with pepper. Sometimes I sprinkle on some garlic powder too just for kicks. I usually sear the seasoned roast off in a little melted butter in a hot skillet on both sides, but that’s not necessary. You can throw the meat in without being seared as well. I do think it makes a difference in the finished product if you’re able to take that step though. 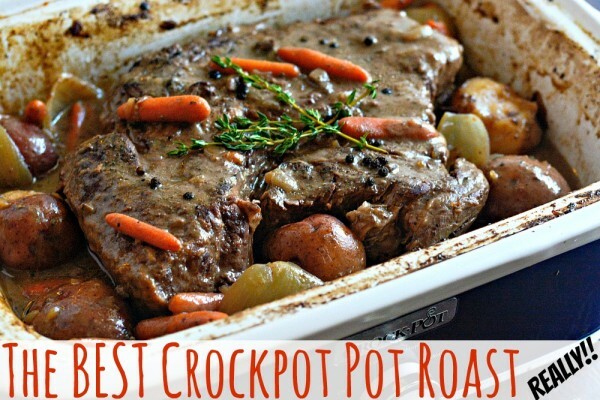 Place the roast in a large crockpot. If I’m using a standard crockpot (like an oval or a round one), I will use a 5 or 6 quart one. I also really like using my 9×13 crockpot for this. While it only holds 3.5 quarts, the shape of it makes it perfect for this recipe. 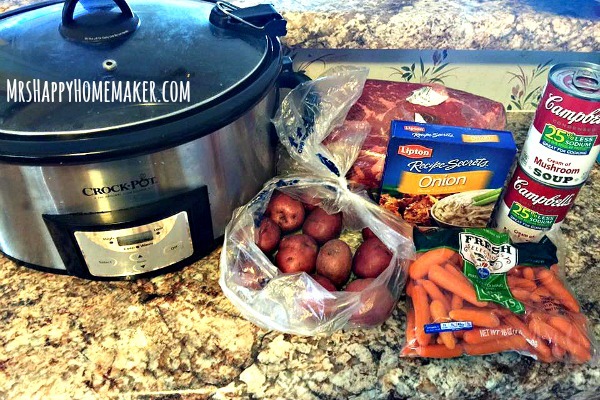 Arrange potatoes, carrots, & onions (if using) in the crockpot too. You can use any kind of potato – just cut them into large chunks. 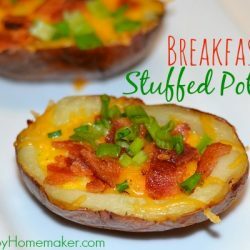 I actually had some very small red potatoes on hand, so I used them and didn’t have to cut them since they were so small already. I also use baby carrots that have already been washed & peeled because that’s one less step for me. In a bowl, combine 2 cans of low-sodium cream of mushroom soup with 1 envelope of dry onion soup seasoning . Spread the mixture over the roast. It will be thick, but as the roast slow cooks all day it will begin to mix with all the juices coming from the pot roast and form the most magnificent gravy! Cover your slow cooker with the lid & cook on low for 8-10 hours. 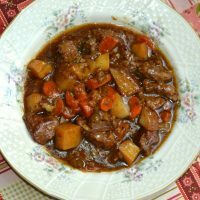 You can cook it on high for about 4-5 hours as well, but I don’t recommend it because the pot roast isn’t nearly as tender as it is when you cook it on low. And boy, is it tender when you’ve let it slow cook on low all day. So, so good – you’re in for a serious treat! Sometimes, I’ll put the crockpot on high for an hour and then slow cook for about 7 hours… but usually I stick to the low & slow. 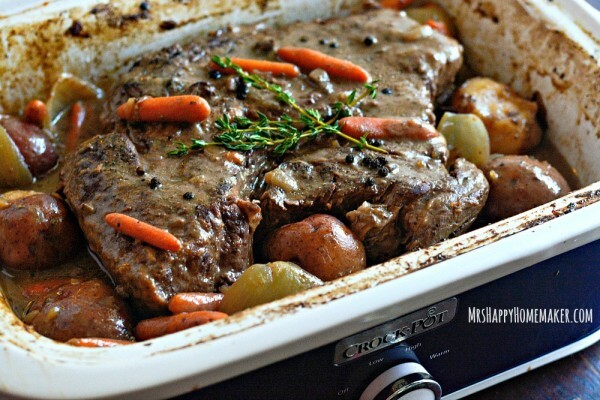 This is the best pot roast I’ve ever eaten. It’s SO good, y’all! 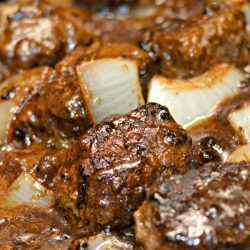 If you wish to sear the roast before placing it in the slow cooker, season with pepper and cook in a hot skillet a couple minutes on each side, then place in the crockpot. I actually like to sear mine with a little bit of butter in the pan, but that’s a personal preference. If you don’t wish to sear the meat (you don’t have to! ), just place it straight into the crockpot. Arrange the potatoes, carrots, & onions (if using) in the crockpot too. Cut the potatoes into chunks unless you’re using very small potatoes. 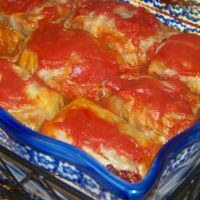 Cover your slow cooker & cook on low for 8-10 hours. This looks delish. 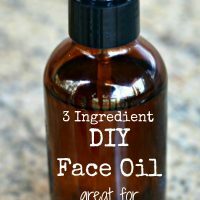 i’ll be trying it soon! Ohhh I will definitely be trying this! We’re trying to learn this whole cooking for more than 1 person thing. Easy and tasty are my favorite! You don’t need water on this? 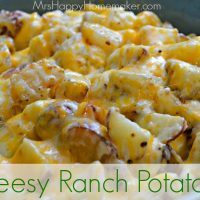 So glad to see you posting, this looks delicious! I don’t like mushroom is there any other soup that would work with this? It doesn’t taste like cream of mushroom once it is cooked. It has a flavor closer to Salisbury steak gravy to me. I don’t like mushroom either so I’ve tried substitutions for similar recipes before even trying the mushroom but none seem to work. 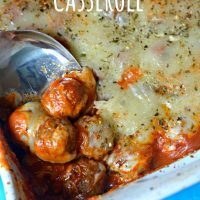 I use cream of celery, and add a half cup of red wine (a hearty burgundy), everything else the same & it’s everyone’s favorite! Took the tip and used Lipton’s Beefy Onion dry soup mix and Campbell’s Roasted Garlic Cream of Mushroom..Also added a half can of water. Our roast was 4lbs and it cooked on low for 9 hours. Turned out SO GOOD!!!! Served with bisquits and green beans, my in-laws were impressed! Thanks for the recipe! I’m making this today crossing my fingers it turns out as awesome as it sounds so excited! I make it exactly like this and it can’t be beat. I have tried other versions and they are not as good as this. I have an even easier tip. 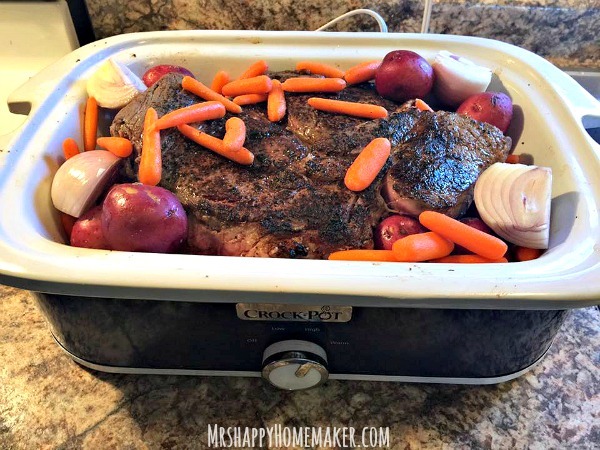 My mother always did the Roast in the crock pot. We loved it. Her trick was to put it in frozen. Talk about tender. I have always done it and even a tough piece of meat comes out tender. 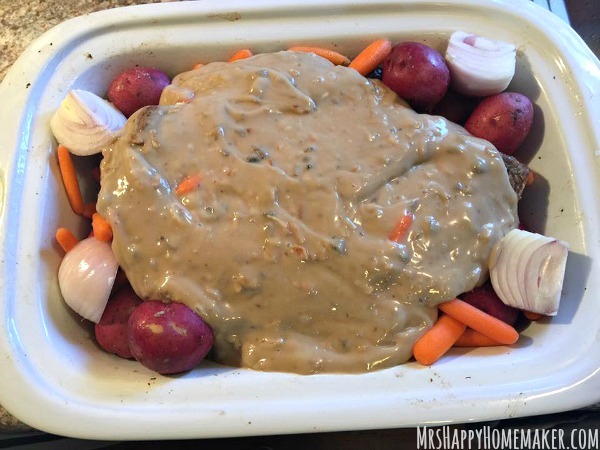 If I use a smaller roast, 2 lbs, do I need to cut back on the gravy mix? Also – have you ever added a liquid? I was thinking about adding a cup of beef broth. do you need to turn over the meat at all? 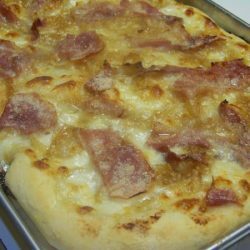 Looks delicious, I will be making this soon! I’m using 1ea cream of celery and 1ea French onion instead because that’s what I have and my kids don’t like mushroom. Hey! Did you try the cream of celery? How was it? Because I don’t eat mushrooms either & if it calls for cream of mushrooms, I always sub w/ cream of celery. I made this for dinner today, and my husband said it was the best pot roast he’s ever had… quite a compliment from someone who grew up having pot roast once a week! Thanks for the awesome and easy recipe! I’m so glad that it was a hit! 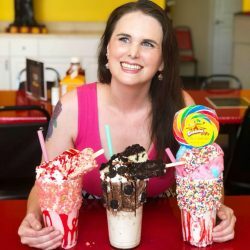 Thank you for coming back and sharing your recipe success! Can you cook it on high? If you can, how many hours should I cook it for. You can… about 4-6 hours. 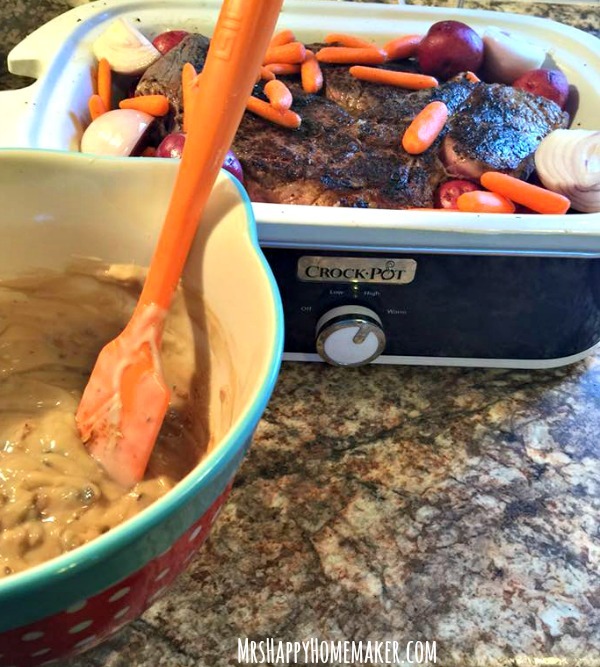 Yes, you can use a rump roast – and the cream of mushroom soup can be switched out for cream of celery with no issues.